Your automobile is our focus, customer satisfaction is our mission. 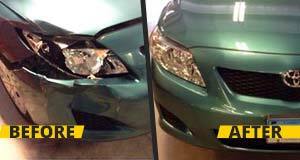 A reputable Naugatuck, CT, auto body shop can improve your car’s condition after it has been damaged. No matter how severe the issues are, you can count on DaSilva’s Auto Body to offer impressive results. Our staff is highly trained and detail-oriented, so whether you want to get rid of minor scratches or need the bumper reattached, we are here for you. A trip to our location can get you the results you need. We focus on providing not only high quality repairs but also prompt project completion. We know you are eager to help your vehicle look and drive better than ever. Whether you need a new paint job or dent removal, you can rest assured our team will do the job right. We have years of experience serving Naugatuck customers, and we can confidently fix most makes and models. You can come to us after a car accident or even after you notice some flaws in the original paint job. You can benefit from the help of an auto body shop that truly cares about your vehicle. At DaSilva’s Auto Body, we offer quality customer service, and you can expect a friendly attitude and results. If you are ready to improve your car’s appearance and performance, call our Naugatuck, CT, team today.